But where most incumbents regard copper-based DSL technologies as a fallback for areas where fiber-to-the-home (FTTH) or fiber-to-the-building (FTTB) deployment isn’t financially feasible (or not yet rolled out), a few seem to be determined that copper is it. BT and Deutsche Telekom are the two camp leaders. 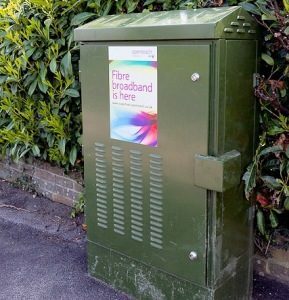 But whereas BT has taken a lot of beating for its stance, facing a “Fix Britain’s Internet” campaign paid by competitors TalkTalk, Sky, Vodafone and ‘3’ demanding a separation of BT’s infrastructure arm, Openreach, DT has received less criticism for its strategy. 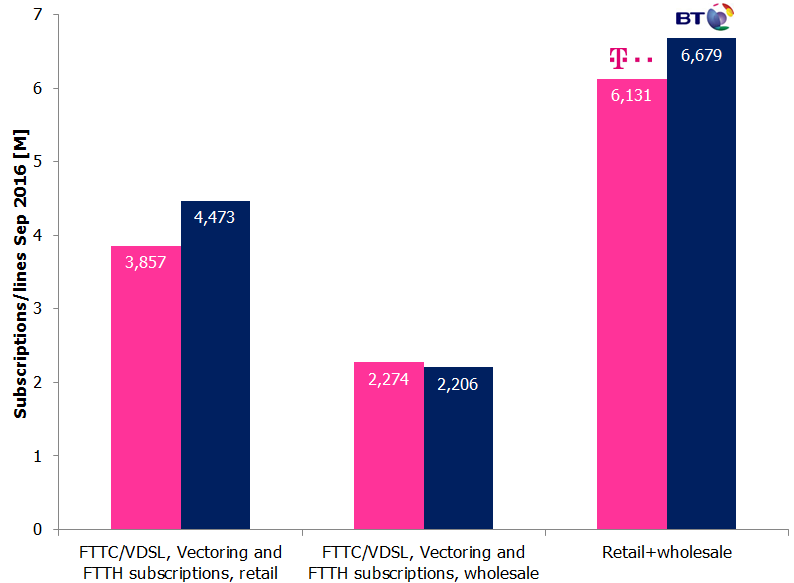 The graph is fetched from the Q3 presentation of Deutsche Telekom: It uses the “fiber” words eight times – but it’s only twice explained as “Sum of all FTTx accesses (e.g. : FTTC/VDSL, Vectoring and FTTH)”. We have on several occasions asked DT to break out the FTTH/FTTB figures but been told that the company has decided not to. As telecoms analysts, we react when we see misleading statements. Strictly speaking, it’s not even true. Already at the day of DT’s Q3 report (10 November), we pointed this out directly to DT, but got no reaction. DT hasn’t corrected its statement. So we have to: DT isn’t the European leader. Let’s now review the more deceptive part of DT’s leadership statement: When the company uses a definition of “fiber” that makes DT look better than it would if using the common industry definition. The comparison countries are not randomly selected: Spain, Portugal, Sweden and Lithuania are some of the actual fiber leaders in Europe. In December 2015, 1.3% of the German fixed broadband connections were either FTTH or FTTB. In comparison to Lithuania’s 71%, this is nothing and DT’s leadership claim appears hollow. Since Germany apparently isn’t the FTTH/FTTB leader of Europe, which country is? In absolute numbers, it’s Spain. 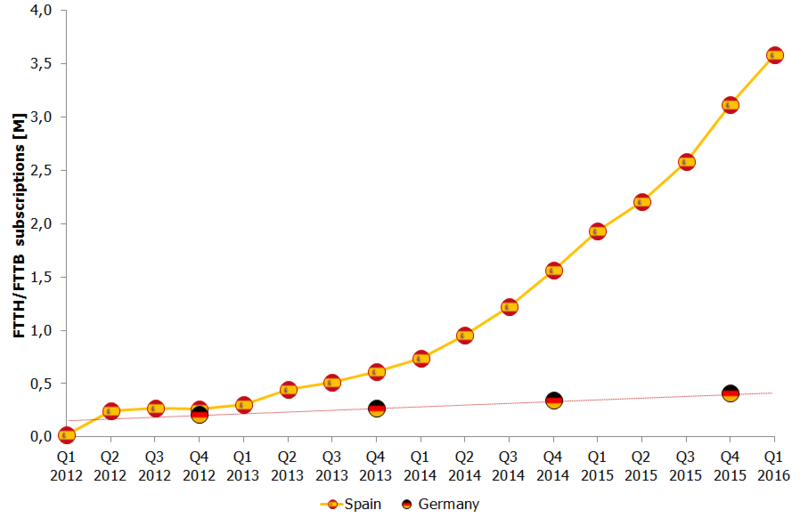 Back in 2012, Spain had as many FTTH and FTTB subscriptions as Germany. 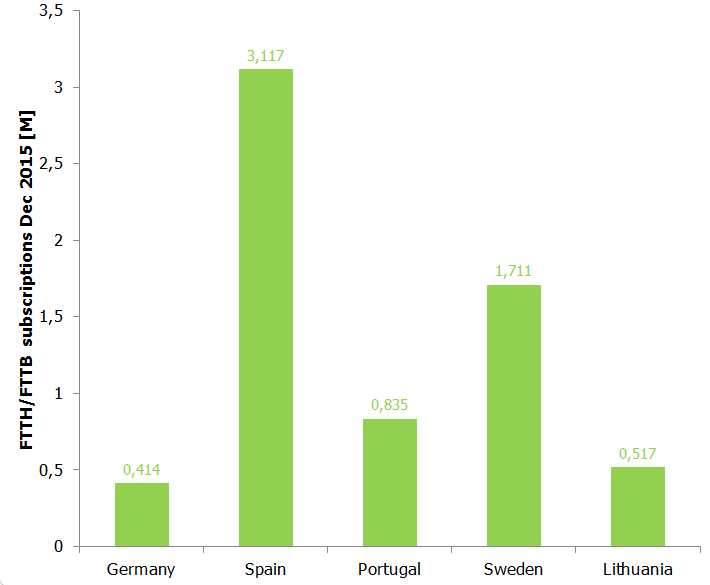 Since then, Spanish operators have added about 3.5 million FTTH and FTTB subscriptions. Germany added 0.2 million. Movistar (Telefónica) passed 16.4 million premises with FTTH or FTTB in September 2016. Orange 9 million. Spain has around 18 million households. That’s leadership. Sweden is predominantly an open fiber market where the network ownership is separated from the ISP. 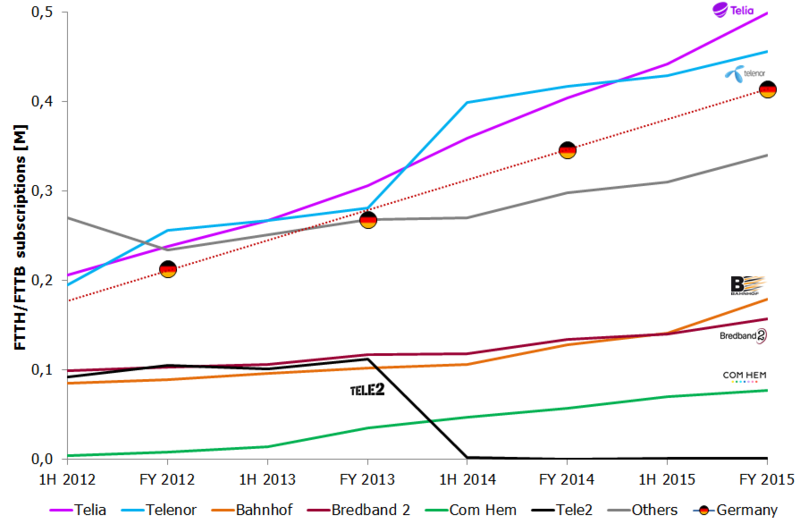 Even though this results in many players and a scattered market, the two largest ISPs over FTTH and FTTB in Sweden, Telia and Telenor, both individually have more FTTH/FTTB subscribers than the whole of Germany including DT. 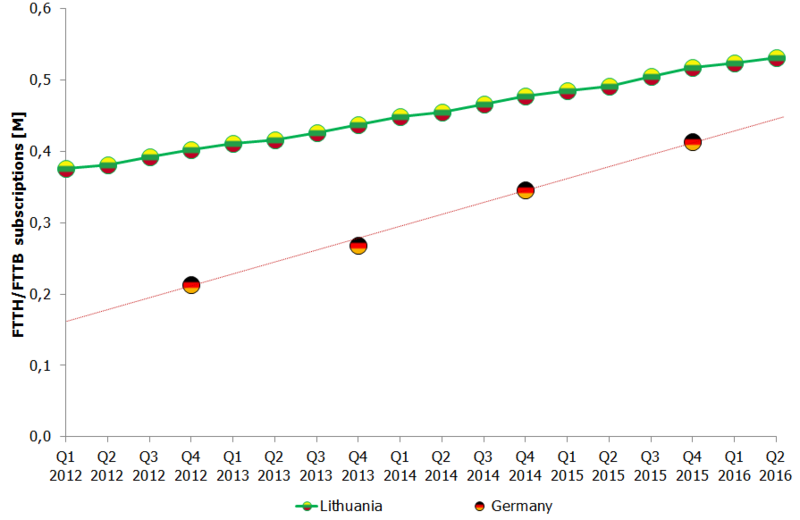 If you think Germany is more advanced than Lithuania, then let’s round off by realising that the FTTH/FTTB market in Lithuania was created a long time ago and that Germany – with 81 million inhabitants – with its current FTTH/FTTB rollout appears to overtake Lithuania (3 million inhabitants) in absolute FTTH/FTTB base only in 2018. Next time, check facts. Don’t try to mislead those that read your reports. And, most importantly, start digging for fiber. 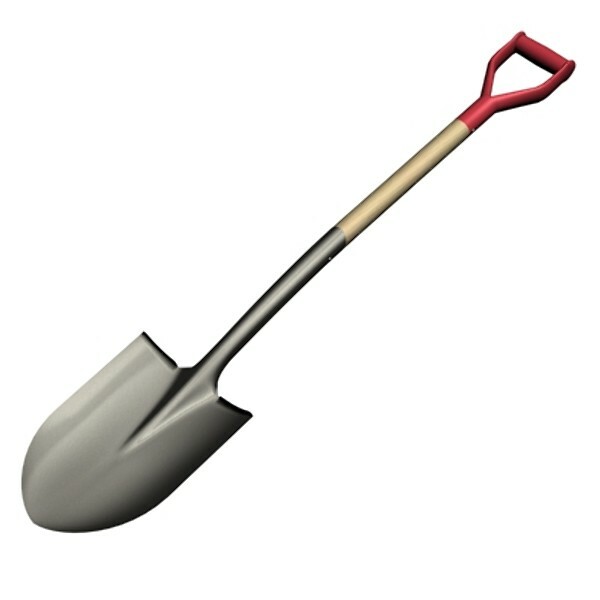 In this business, leadership is created with a shovel.